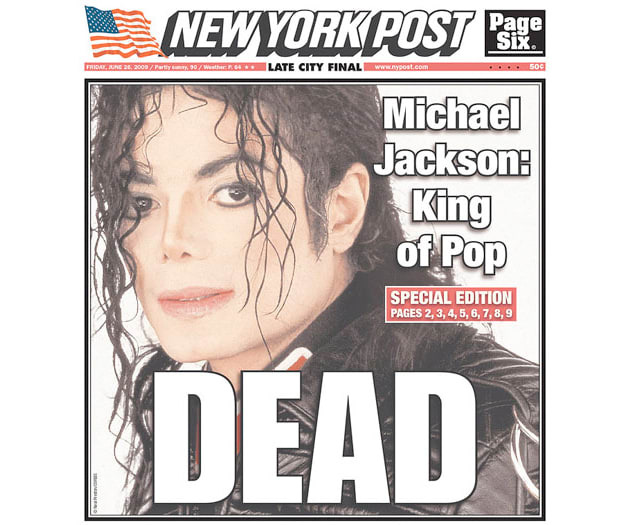 Micheal Jackson&apos;s death yesterday afternoon left newspapers plenty of time to think of creative headlines, and as this morning's alarm went off, all we could think about was what types of cringe-inducing headlines the New York Post was going to come up with. The giant "DEAD" isn't exactly tasteful, but it's fairly tame, considering what they could have put (and what they've printed in the past). It's likely that the inset spread, "JACKO HAS GONE TO NEVERLAND" didn't make it to the front for this reason. The Post has a storied history of creative Jackson headlines. Read on for a look back at 5 of the notorious paper&apos;s shots at the King of Pop. Oh, and again, R.I.P to the best who ever did it! • When MJ was accused of child molestation, the Post took the opportunity to play up his Neverland ranch. • It&apos;s called a rhyme scheme, and it&apos;s a literary device. This is hi-brow stuff, folks. • When Jackson finally did get busted for child molestation charges, the Post used his iconic album BAD title to drive the idea home. • This one doesn&apos;t even make sense, guys.